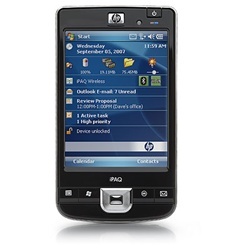 The HP iPAQ 210 Enterprise Handheld - with the power to run your business applications, a 4-inch touch screen display and 802.11b/g wireless networking - delivers enterprise-class connectivity so you can mobilize your business and maximize results. 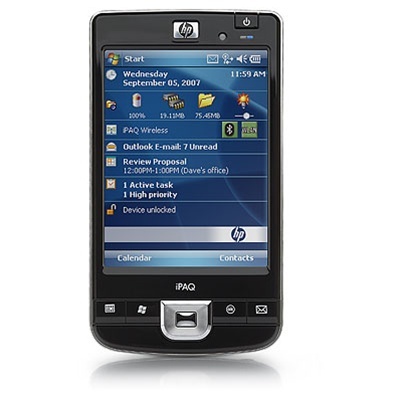 With a sophisticated design, a big 4-inch touch screen display, and a planned 3-year lifecycle, the iPAQ 210 is a great deployment platform for enterprise applications. Access the Internet and email with integrated 802.11b/g wireless networking. Connect to Bluetooth peripherals like headsets or keyboards. Enable unique solutions by attaching peripherals with the HP Smart Connector. Use it as a deployment platform for enterprise applications. Or use your familiar productivity applications such as Word, PowerPoint and Excel with Microsoft Office Mobile. Store your business-critical information with high-capacity SDIO and Compact Flash. Tested to work out-of-the-box with enterprise applications. Also enjoy convenient global services and support from HP.